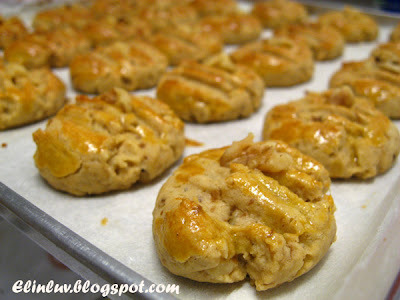 Chinese New Year is drawing nearer each day and I have not make any CNY traditional cookies yet. Attending too many dinners lately thus not being able to start making any traditional cookies :( but yesterday afternoon I made this walnut shortbread butter cookies from one of the new cookbooks I bought recently....told you ! :))) I just can't sit still if I don't make this :p Thought this would be nice for a change to the traditional cookies. 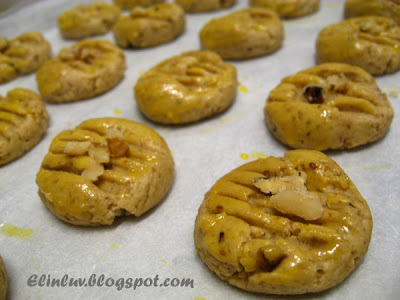 I tweaked the recipe by using walnuts instead of hazelnuts. And Bailey's instead of buttermilk. 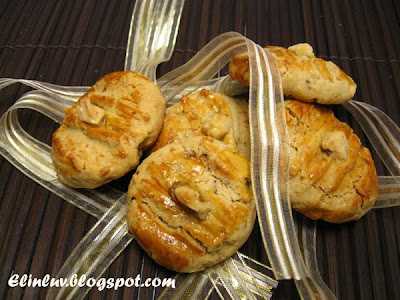 I just make use of what I have in the pantry and the only nuts I have is walnuts :)) The texture of the cookie is fluffy and light with a slight crunch from the walnuts . Great cookies and no regrets trying this out. I used walnuts instead of hazelnuts and it turned out great! 1. Beat A until light and fluffy. Add in B, cream until smooth. 2. Add in sifted C, mix until well-blended. Add in D, mix till well-incorporated. 3. Divide the dough into 10-15 gm each and shape into balls. 4. Place it onto a greased pan, press until slightly flat. Egg wash the surface and place the whole-shelled hazelnut in the center. 5. Bake at 170ºC for about 15-20 minutes or until firm. Enjoy and have a Happy Cookie Day! I have never try shortbread cookie before, must give a try soon. 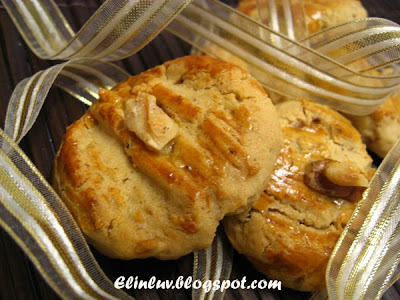 I love to use pecan for this shortbread cookies! Yours looks remarkable. Time to prepare for Chinese New Year. This is definitely a good cookie to include. I love shortbread. Looks fabulous. Like this, yes, it's good to change a bit, i.e. not having the same old traditional cookies. Will definitely KIV this one. looks really crunchy and crisp! love walnuts. LOve shortbread. Love the whole thing Elin!! elin, i want to order for cny also.. I love the idea of using Bailey's. Yum! 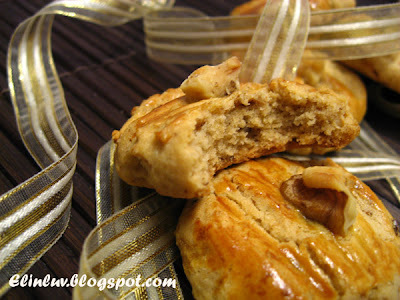 I love walnut cookies! After I buy an oven, I'm surely gonna try your recipe out! Btw, do you mind to share what oven brand are you using ? may i know in yr recipe, u r useing 12 tsp or 1/2 tsp baking soda? Elin, thanks for the super duper yummy cookies.....yesterday i tried to taste one piece...after that i feel like wanted to take another one...later i tell myself I need to stop as it is late.....I like it becacus it's not so sweet...and just nice!! thanks again!! Love CNY! all those gorgeous cookies...maybe I should bake some this year! Hi pigpigscorne....this is a great shorbread cooie...neither too sweet! 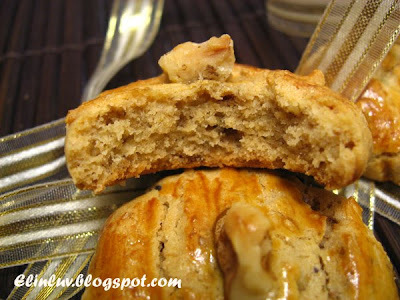 The ground walnuts and walnut bits makes it delicious..yum yum :) You will love it! Sounds like we all getting busy these days! I've already started the preparation one week ago. Extremely exhausted lol! Especially after school reopened. Still a long list to try out. Yours look wonderful and perfect for the coming celebration. Have fun! Cheers.